armscyes | I Sewed This! It’s from this book, complete info on my books and links page. 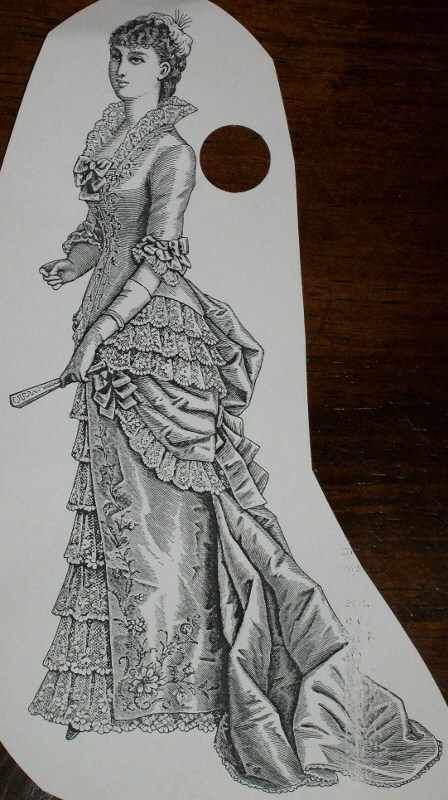 Here is a photocopied picture of the engraving in the book. Because it isn’t off the shoulders and has 3/4 length sleeves, it’s for a less formal evening occasion, like a dinner or theater rather than the opera or a really important ball. 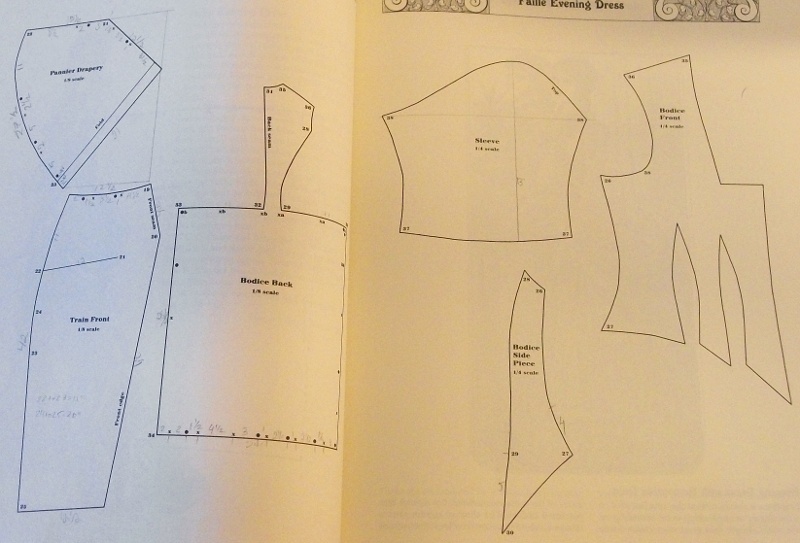 Here are the pattern pages from the book. Pattern from the book. 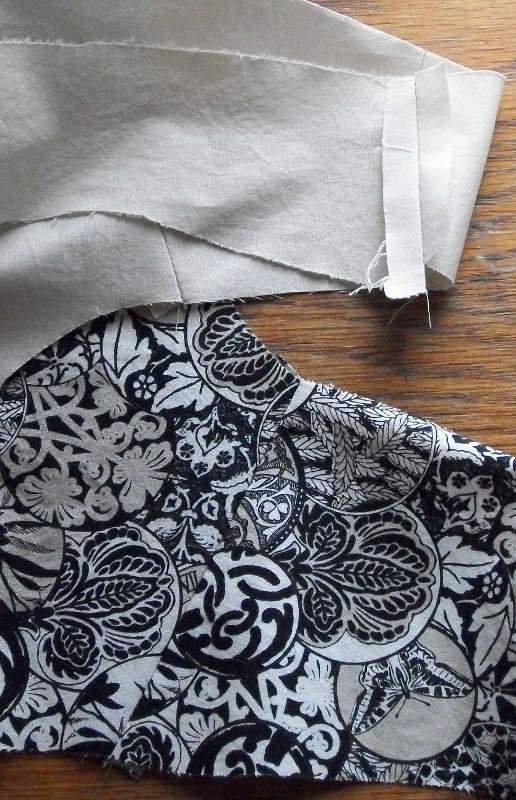 I used my own slopers to make the pattern in the right shape, guaranteeing that it would fit me properly. 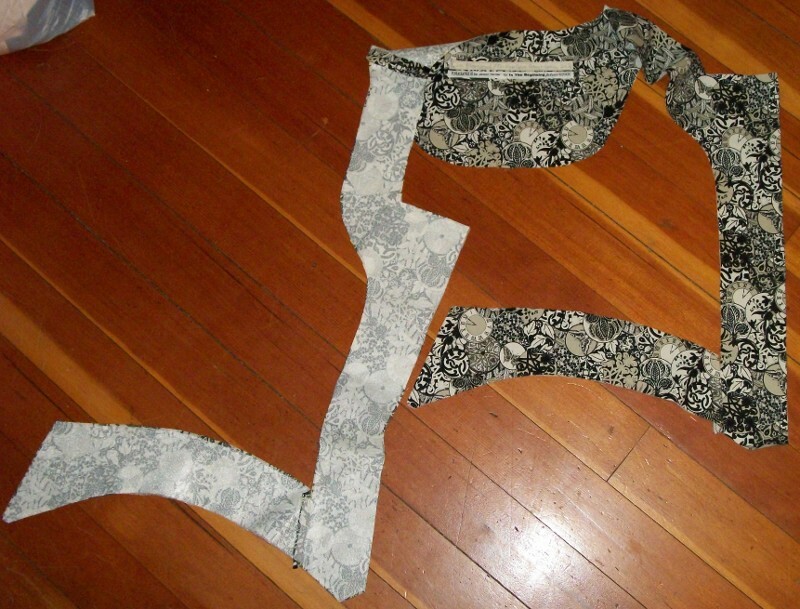 Below is how I sewed it together. Since I hadn’t made this style before, the train presented a few challenges, but the rest was pretty straightforward. 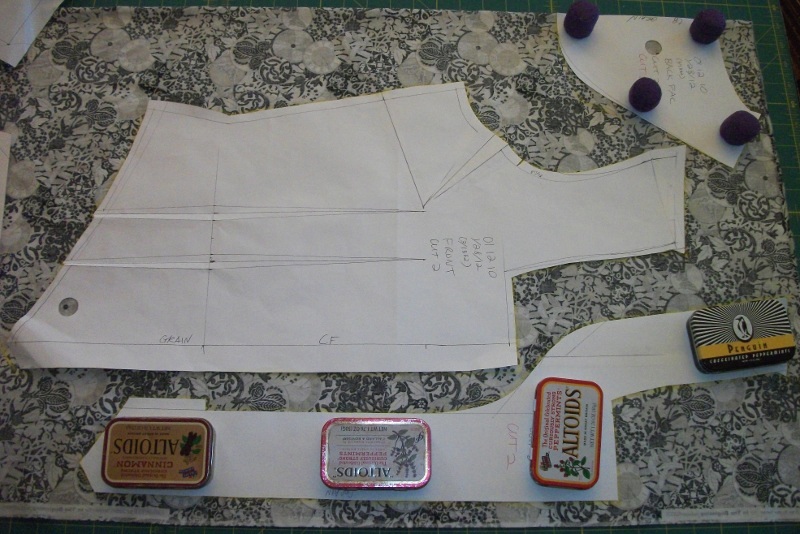 Laid out and weighted with pattern weights (the small purple things at upper right) and lead weights in empty Altoids tins. 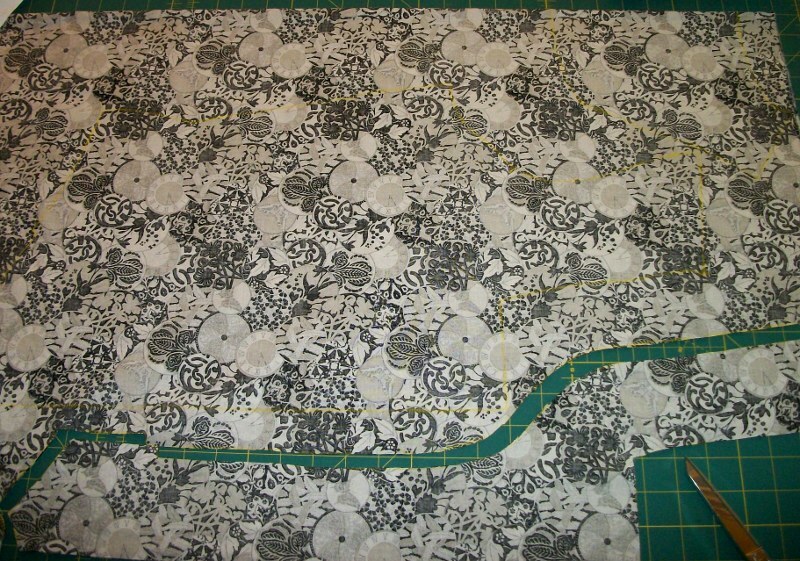 Once piece is cut and the others are traced on the fabric. You can just barely see the yellow china marker lines. The interfacing is fused on. I used the tricot nylon knit kind of fusible interfacing (this brand was French Fuse), which seems to cause few problems. Remember to preshrink it by soaking in hot water for 15 minutes then gently squeeze out the water and hang to dry. Then apply with a pressing cloth and the iron on wool setting and full steam. I use the waxy kind of tracing paper instead of the chalky kind. Follow the lines you already traced. The back pieces are sewn together. 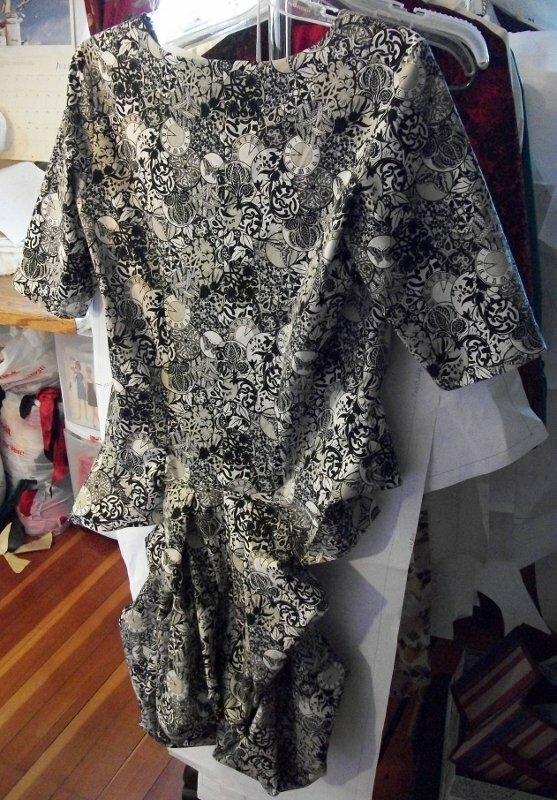 Back and side back pieces, bodice parts at top and train parts below. The facing pieces are sewn together. 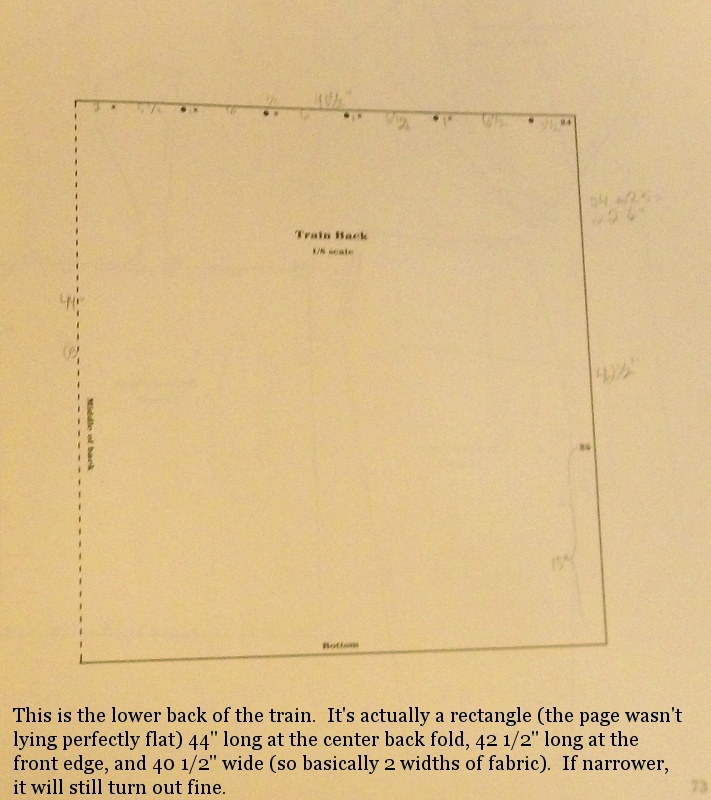 Because the top front of the train is sewn underneath the lower edge of the front of the bodice, I faced that as well as the center front and the neckline. I drafted my own pattern and I make the vertical darts press toward the center and the horizontal ones downward. The back lining pieces are sewn together. 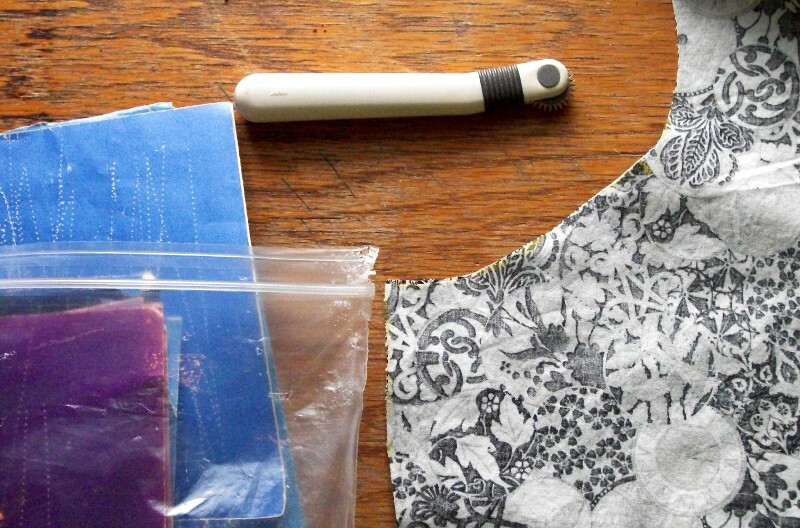 The back lining is just for the bodice, not the train. 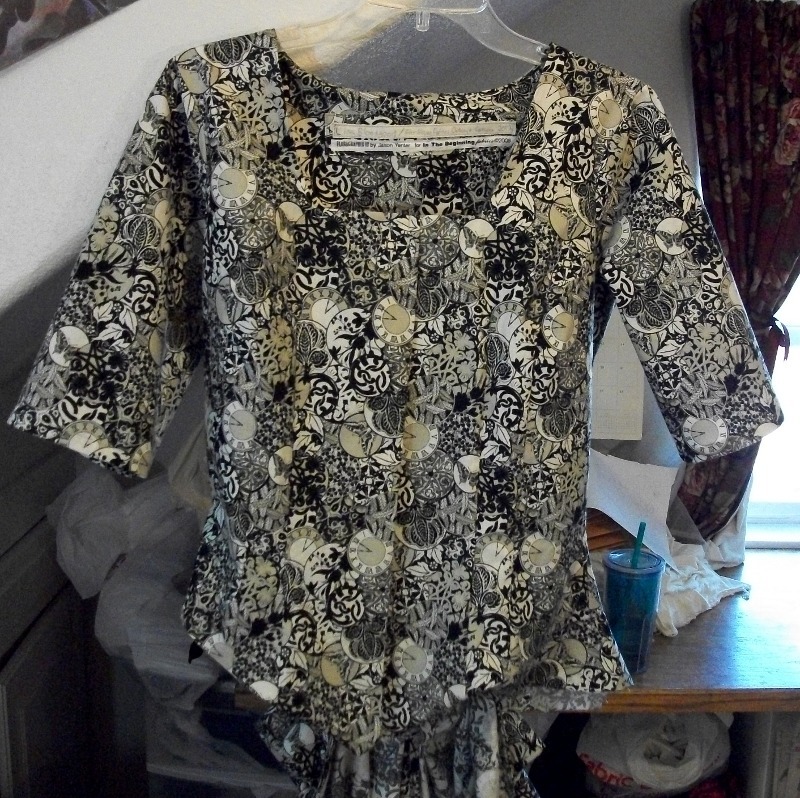 The back neckline is deep here because it will be sewn to the facing, which is also deep. 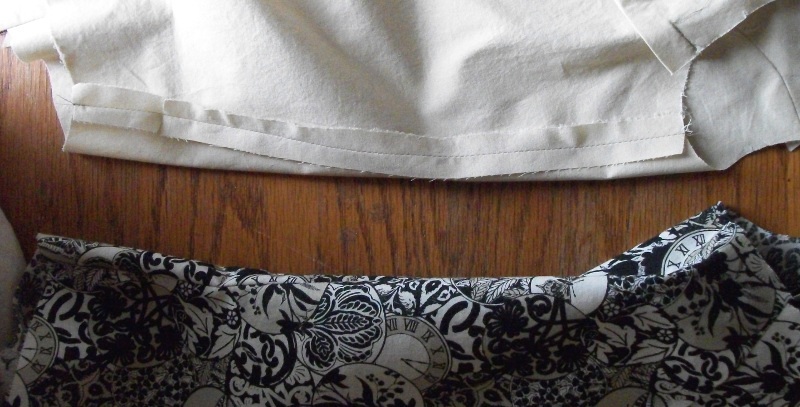 The tucks in the front lining, where the darts are in the front (on the outer, or self, fabric). Instead of doing full darts in the front lining pieces, I just did some tucks to keep there from being so many layers of fabric in one spot. 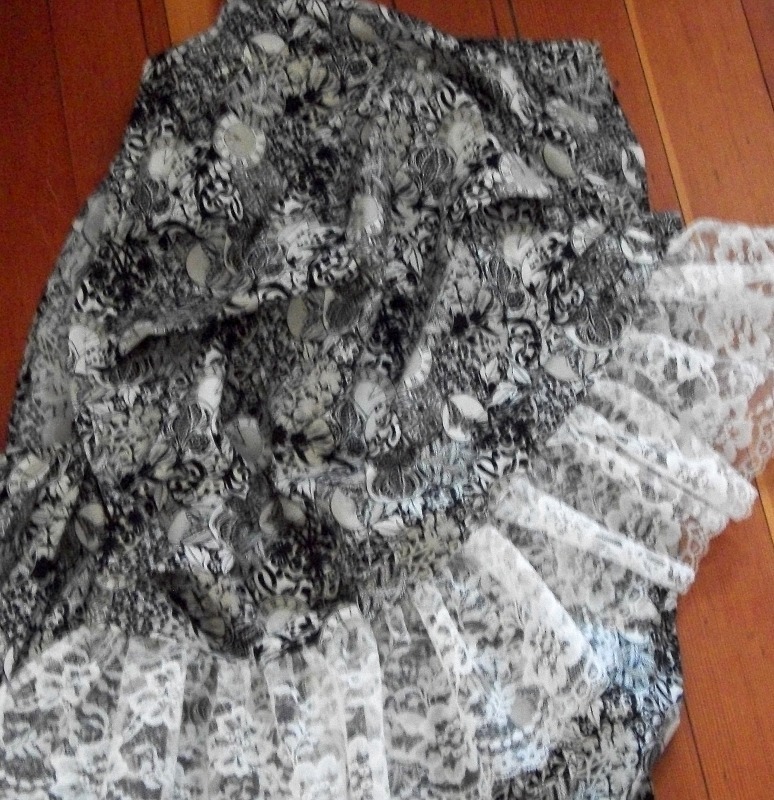 This is the upper back part pleated so it is a pouf. 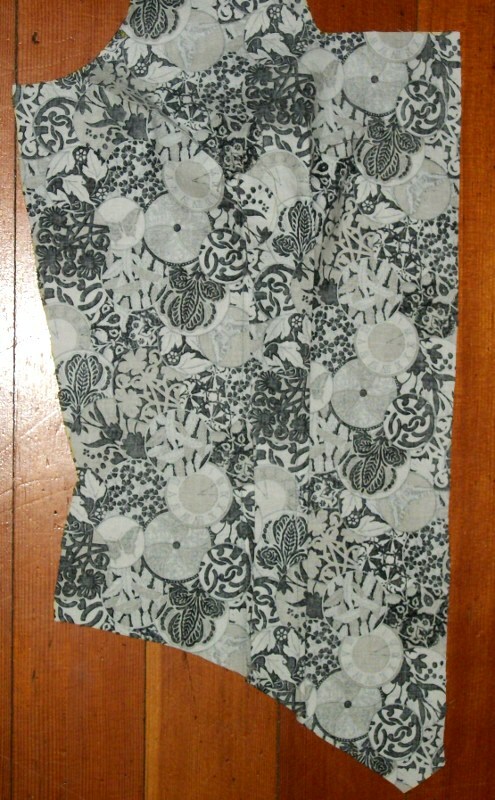 With a simple rolled hem (fabric turned under twice, pressed, and stitched). The shoulder seams are sewn. The side seams are sewn. Both the self and lining fabrics. Part of the train is pleated. This is the lower back piece. 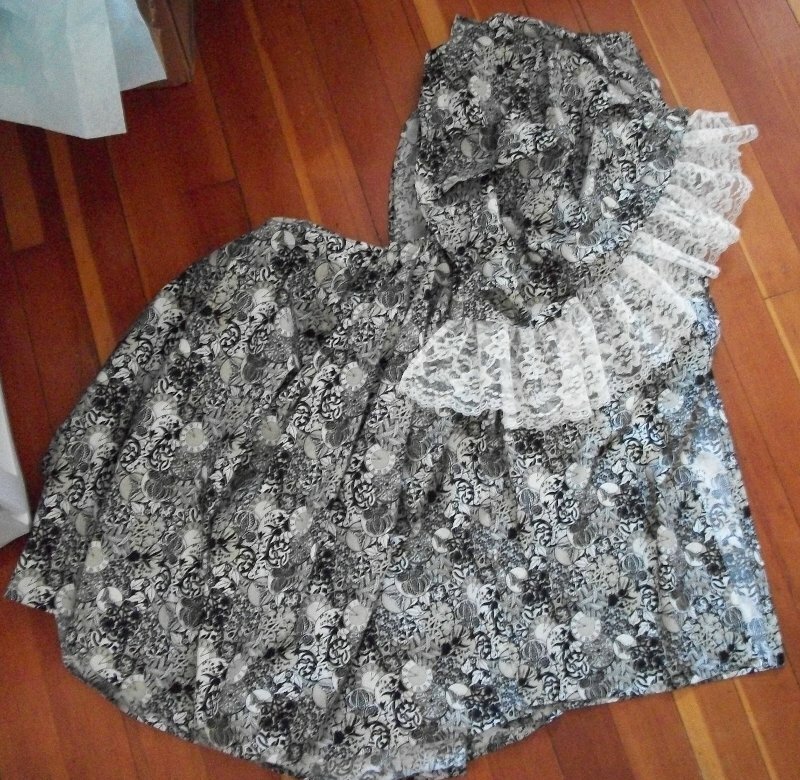 The sleeves are attached to the bodice, front view. 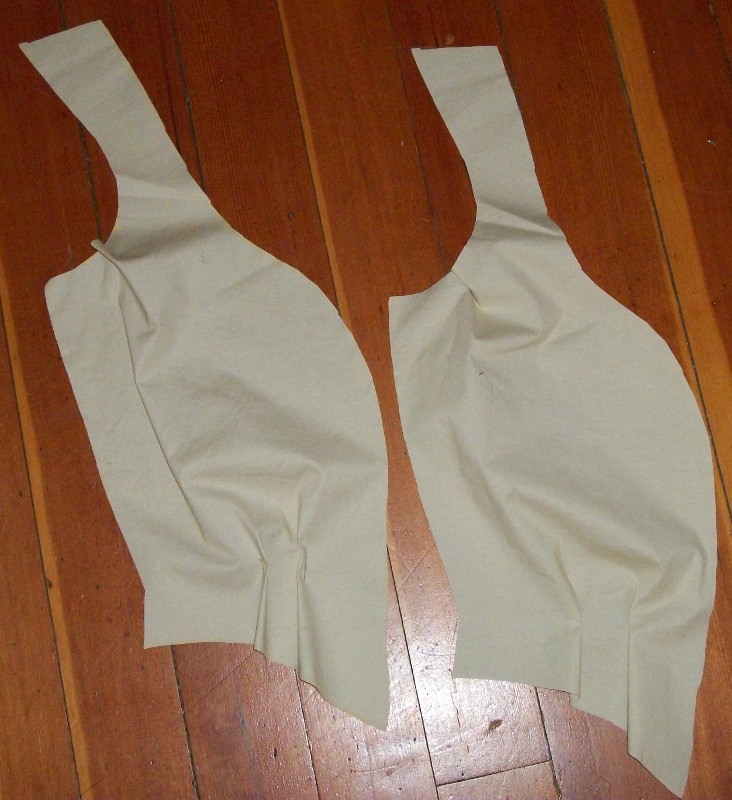 Because I sewed the side seams before sewing in the sleeves, I also sewed the sleeve seams and pressed them. Then I sewed them into the armscyes. 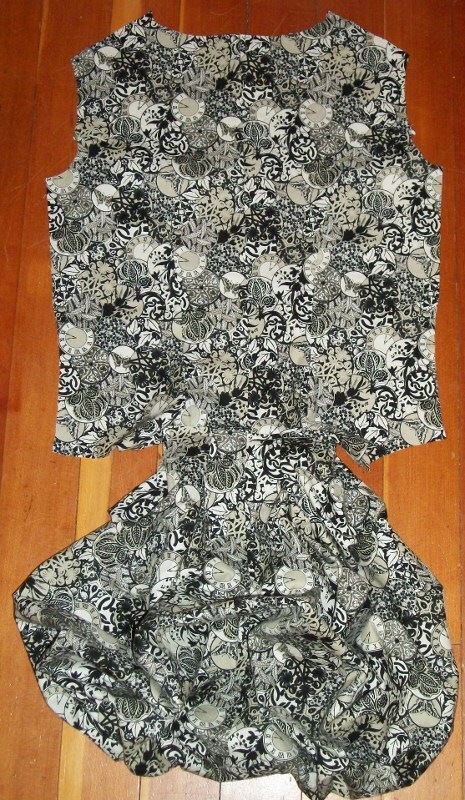 The sleeves are attached to the bodice, back view. 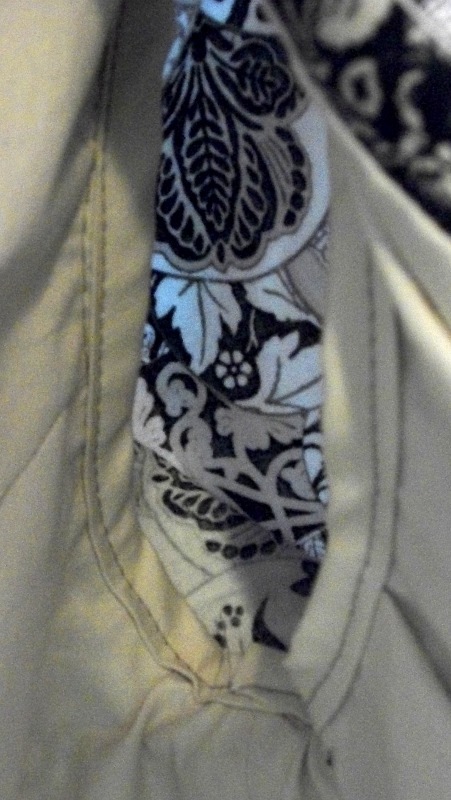 The lining is attached to the bodice at the facing edges. I didn’t line the sleeves. I felt that they didn’t need it but the bodice did. 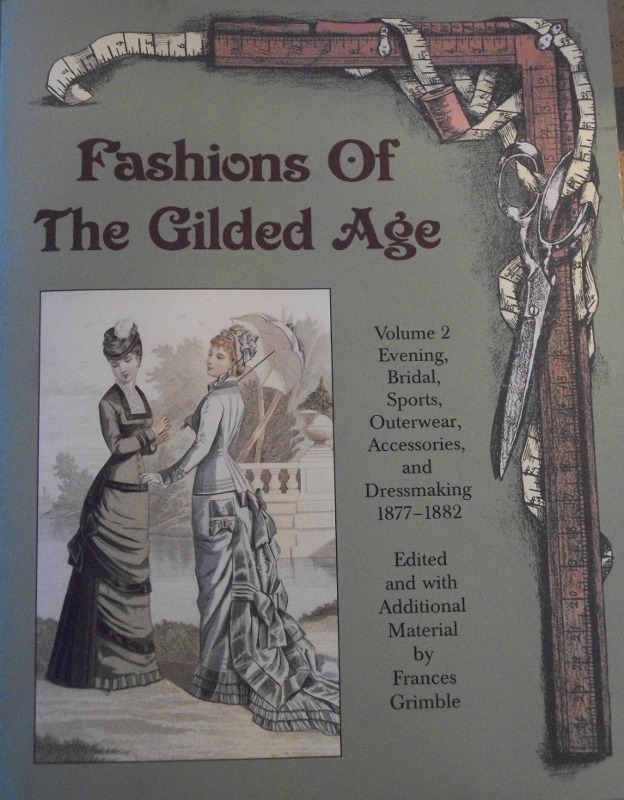 First, the facings were sewn onto the bodice, right sides together, clipped, understitched, turned right side out, and pressed. Then the lining was sewn to the outer edges of the facings, flipped right side out, and pressed. 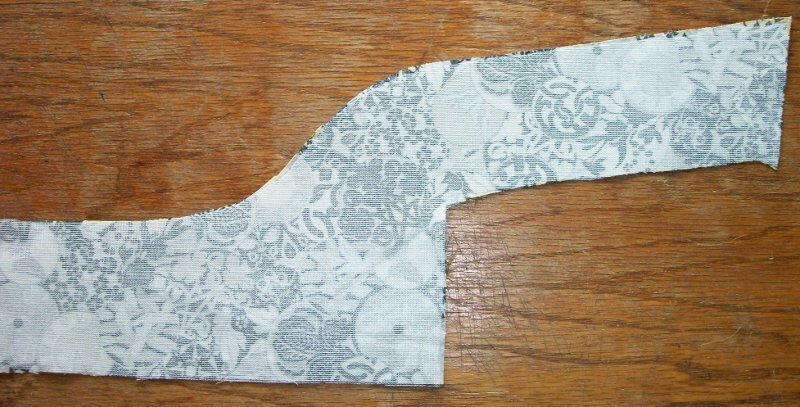 The armscye/sleeve seam of the self fabric and the armscye of the lining fabric are joined and covered by bias tape. I thought it would be a nicer finish than if I had overlocked the seam. 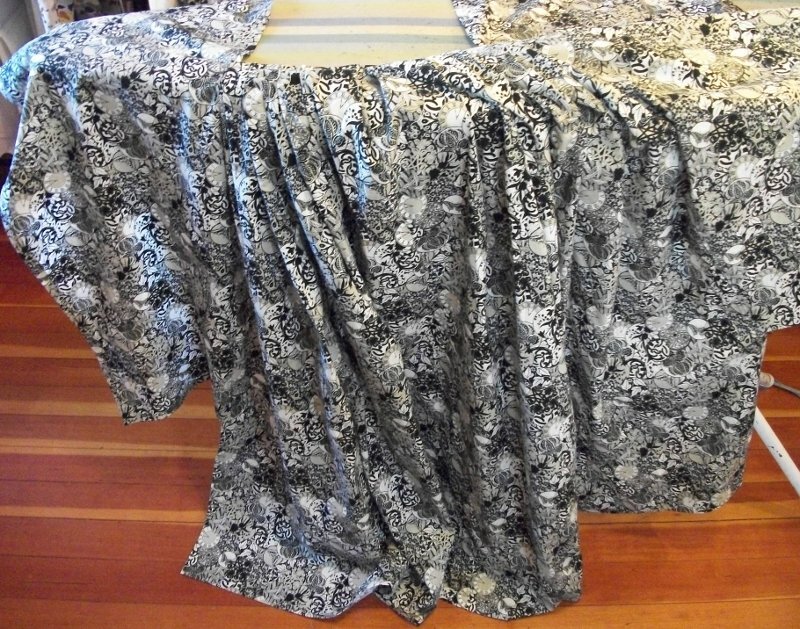 This was a lot of fabric for the lower train and I ended up shortening it. I didn’t want it stepped on or to drag it through the mud. The train back (on the left) and the front of it (on the right). The whole train folded in half. The upper front part of the train. 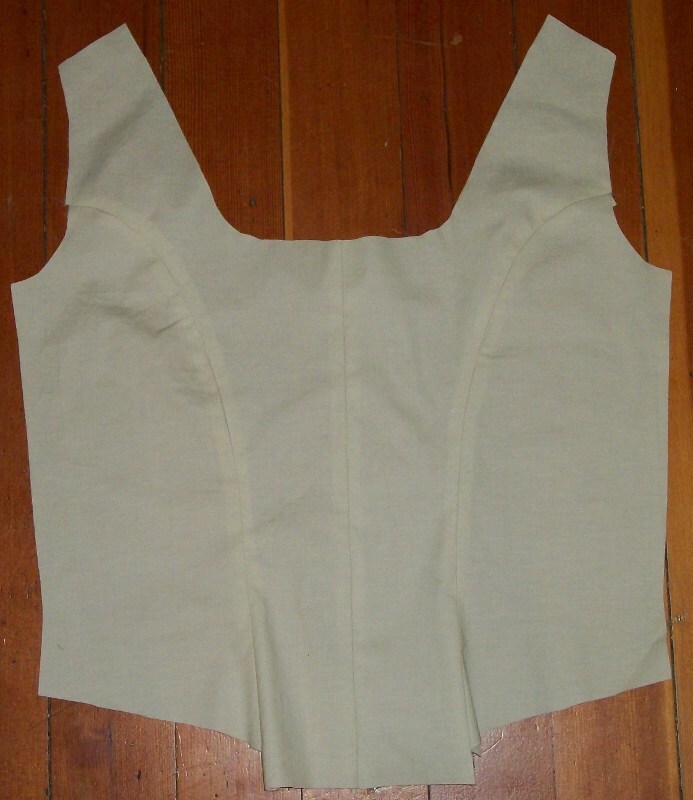 The very top ends up tucked under the bottom of the bodice and sewn on the inside. 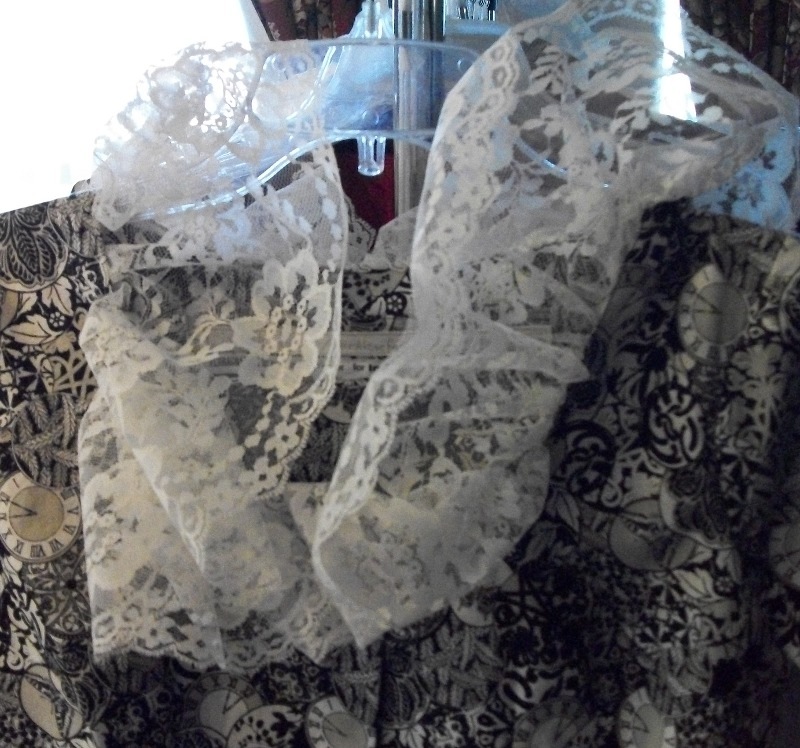 Lace on the neckline. I didn’t like how it turned out so I removed it and used less lace. Too much and it didn’t hang right when I was wearing it. Ends sewn together and pressed. 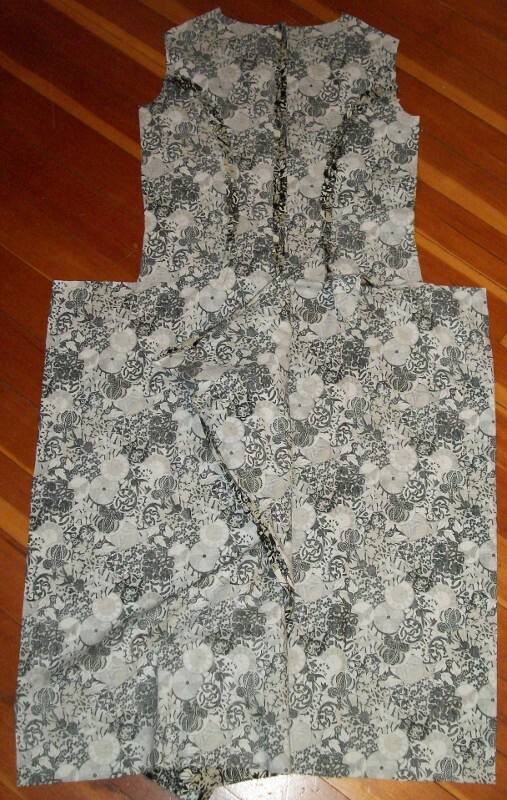 Front of dress with the new neckline lace. 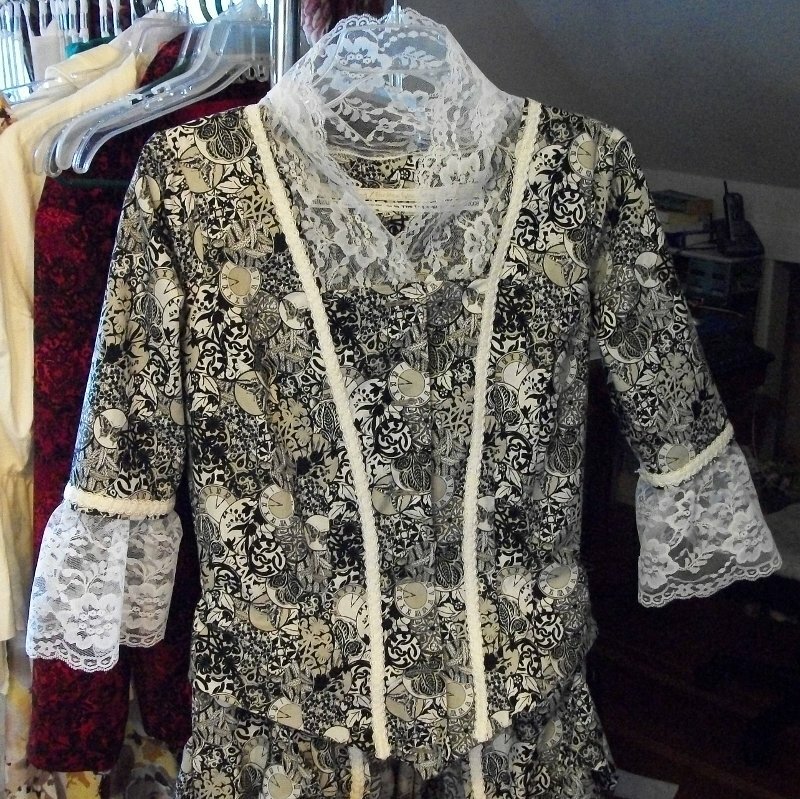 The lace on the neckline is better now. 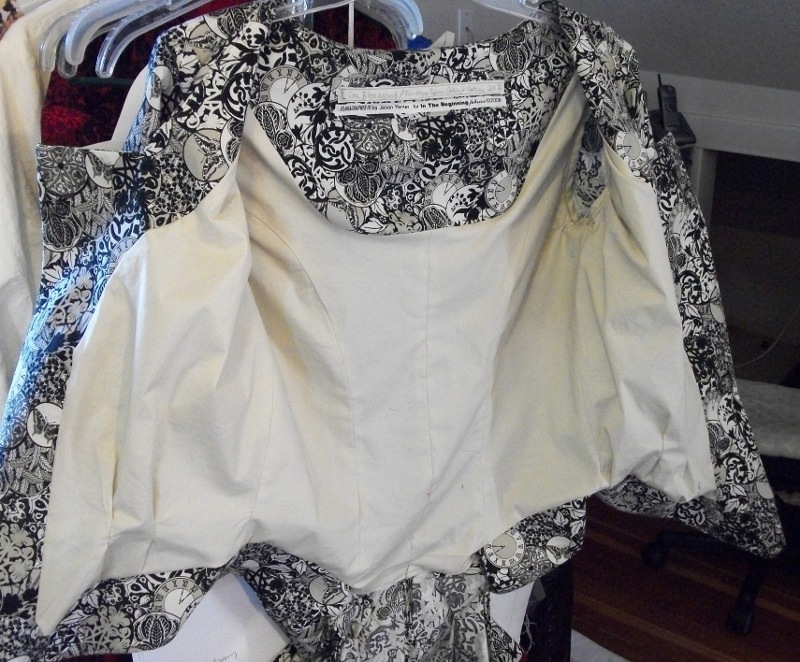 I hand sewed the front of the train to the inside of the bodice. 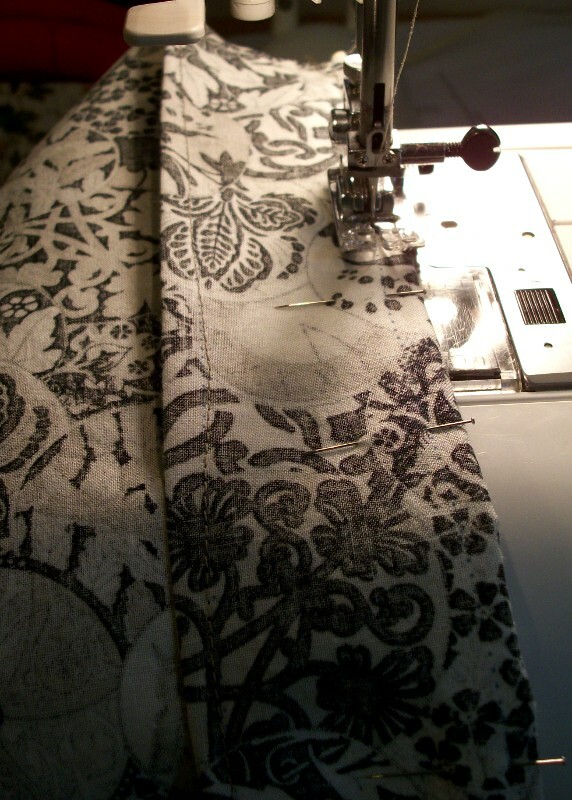 Now you can see the relation of the pattern pieces–especially those of the train–to the finished garment. 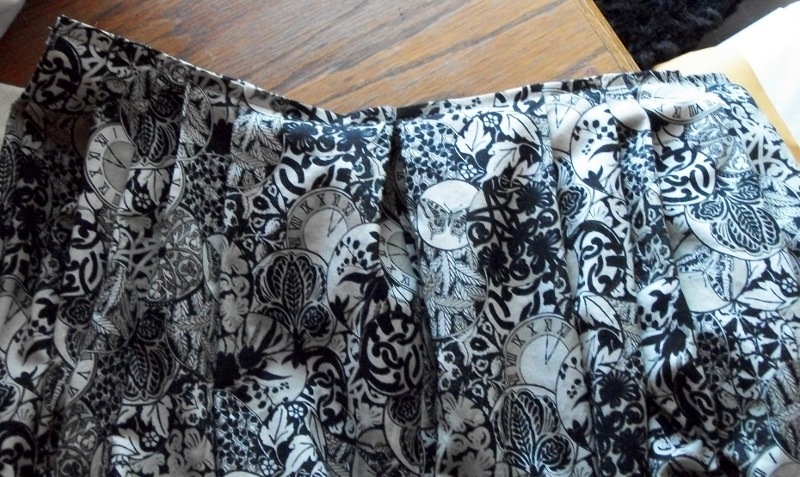 Detail of the front with the buttons sewn on. Buttonholes and buttons are last. 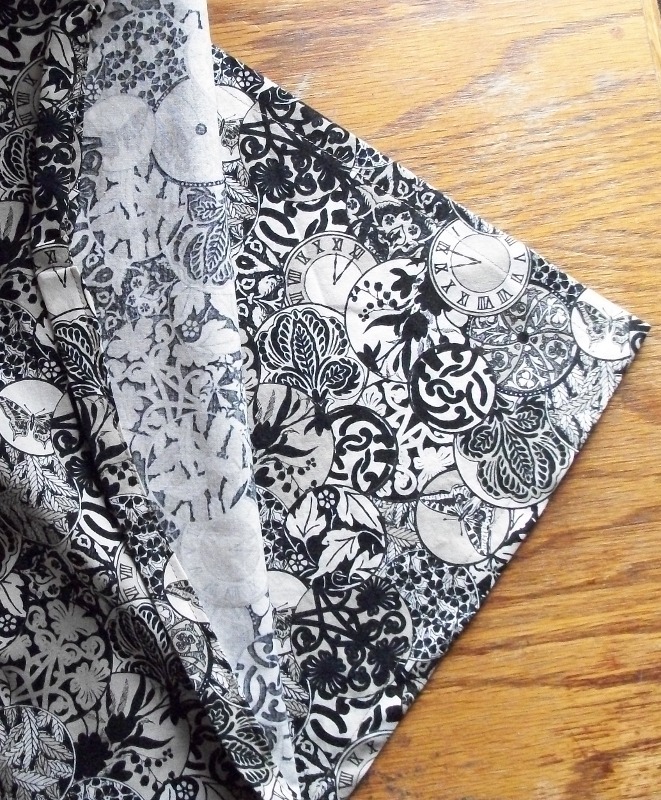 The buttons have a scrollwork detail on them that goes nicely with the print. Sorry you can’t really see that here. 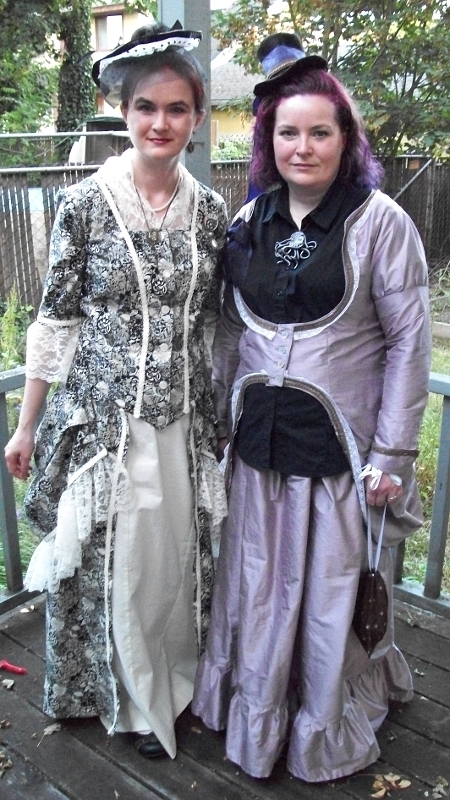 Here I am in the dress with my sister Lydia, ready to go to the 1st Portland Steampunk Ball in July 2012, photo by my brother-in-law, Daren. My skirt is just plain cotton. 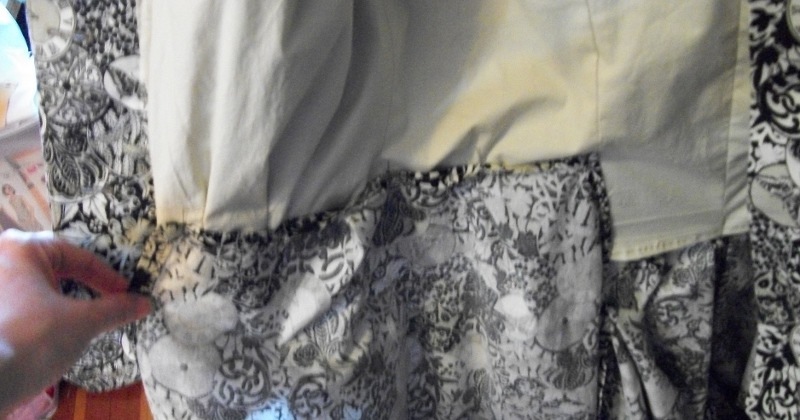 I used my skirt sloper and made a gored skirt, splitting the sloper at the darts and making it longer with some extra flare at the bottom so I had room to walk. 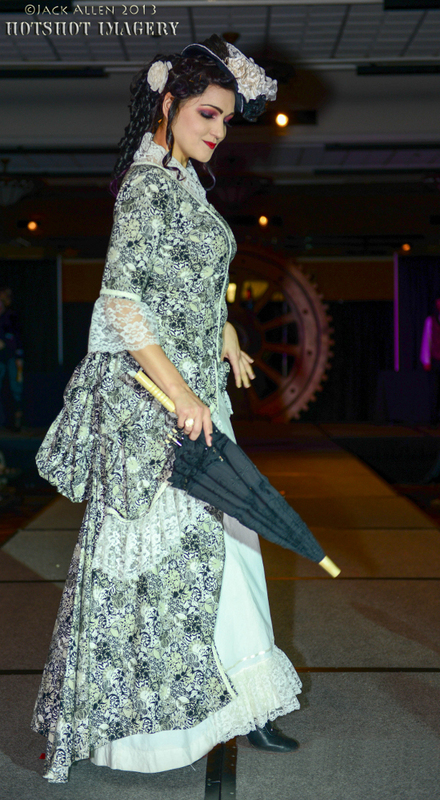 My friend Christelle modeled it for me at the GEARcon 2013 Steampunk convention fashion show (I didn’t get a copy of the small one below, but I’ve added a larger of another pose of her in the same dress below that). Photo by Jack Allen of Hotshot Imagery, July 2013.